This flavorful creamy dairy-free yogurt is so easy to make! 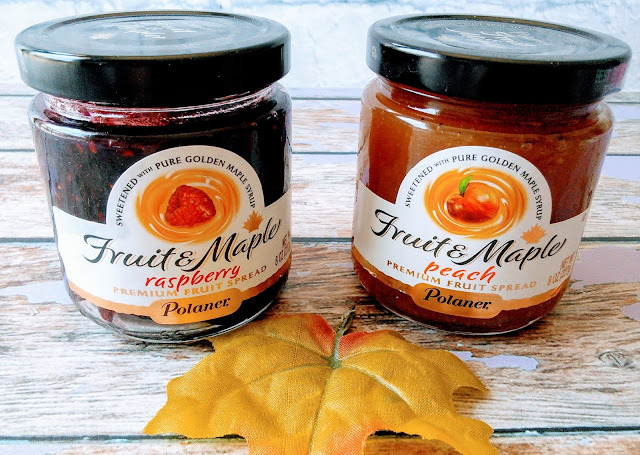 I received products from Genuine Health and Polaner to facilitate this post. My seasonal allergies have been really bad this year and as a result, I have been coughing way too many times a day. My allergy-induced asthma has become uncontrollable. My allergy medicine used to be enough to keep my asthma under control but it does not seem to help any more. This asthma cough began earlier this year when it was cold so I thought it was a bad cold. When it did not go away when spring came, I then thought all my coughing was due to the weeds. I know I should have made a doctor appointment but that would require me stopping my allergy medicine for 2 weeks and it takes 3 months to get a doctor appointment. I did not want to stop my allergy medicine as my coughing gets way worse when I forget my medicine for a day. My youngest has asthma and when he starts coughing bad, I know he forgot his allergy medicine. Could dairy be causing my allergies? My dairy issues have been worse this year and I could no longer eat ice cream without feeling sick. I have always had lactose issues with dairy and have stayed away from drinking milk. I used to be able to eat a small dish of ice cream without feeling sick and cheese never gave me any problems. I began to look back to when this bad cough started and it was then I started to have a bedtime snack of cheese and crackers every night. So I decided to stop all dairy, including cheese for a month to see if that could help this asthmatic cough of mine. I have not had cheese for eight days and I am noticing that I am coughing less. So maybe it is dairy. I was hoping it was not as I love cheese and yogurt. I have been craving pizza and yogurt so bad too. So I then remember a Tropical Coconut Mango Protein Parfait With Chia Seeds that I made for my son with protein powder earlier this year. 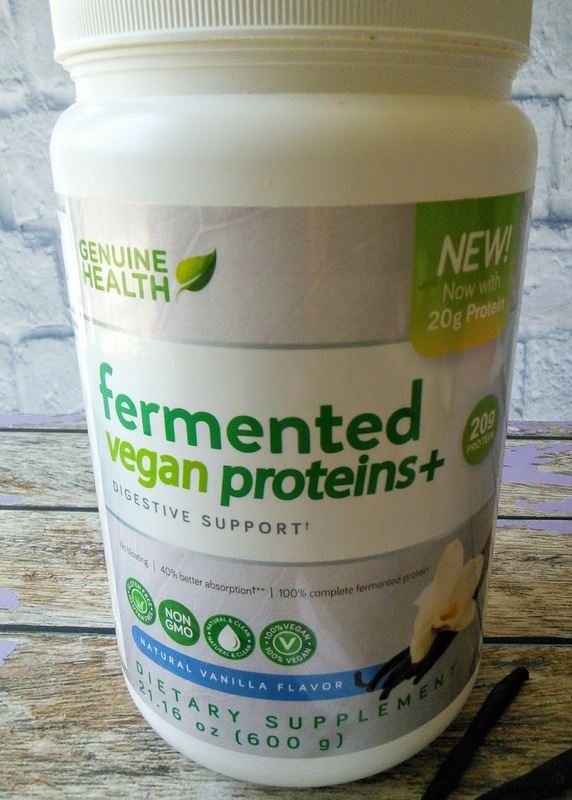 I then realized I could take my vegan dairy-free protein powder and make a dairy-free yogurt with it to satisfy my cravings. I added this delicious Fruit & Maple fruit spread and it has been a wonderful bedtime treat for me. I also add some granola to the dairy-free yogurt for a parfait when I am craving ice cream and don't want to pay $5.00 for a pint of dairy-free ice cream. Now if I can find a substitute for cheese that does not cost an arm and I leg, I will be happy. The chia seeds swell to make the dairy-free milk and protein powder real thick like yogurt. 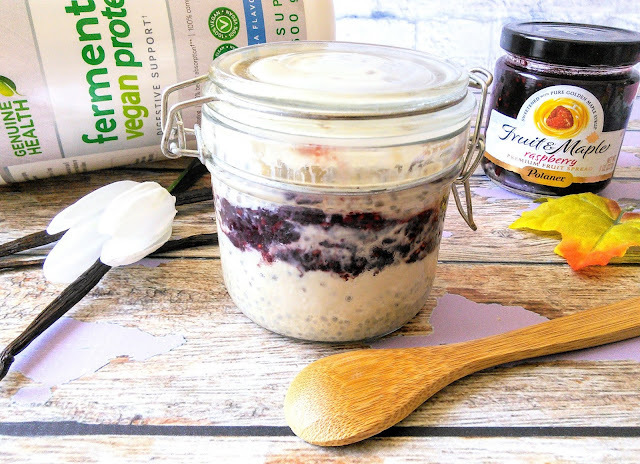 I recommend only using Genuine Health protein powder to make this creamy dairy-free yogurt. I tried using a different protein powder as my son wanted a chocolate yogurt and it did not get thick like yogurt. 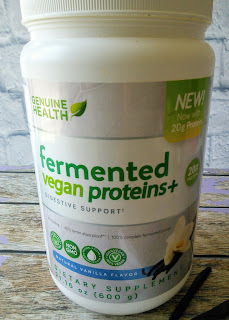 Genuine Health does make a chocolate vegan protein powder and that does get thick with chia seeds as I made a Chocolate Peanut Butter Pretzel Protein Pudding with it that was so delicious. It is amazing what you can do with chia seeds! Place the coconut milk and protein powder in a shaker bottle and shake well to mix. Add the chia seed to the shaker container and shake well. Place the container in the fridge for a couple of hours so it can thicken. Add the raspberry maple spread and stir well. This dairy-free yogurt can be made into a parfait with some granola and fresh fruit. I'm so sorry about your allergies. I hope you'll feel better soon. The yogurt looks so yummy and the process looks so easy. I will try this. Thanks so much for sharing! Many usually have allergies because of dairy products and I'm sorry to hear about yours. Glad you curb them by taking dairy-free yogurt that looks so yummy . Even though I love dairy products so much! I like to add chia seeds in my yogurt for a boost of energy but I never thought that they actually can thicken almond milk for example. That's great to know for future recipes. 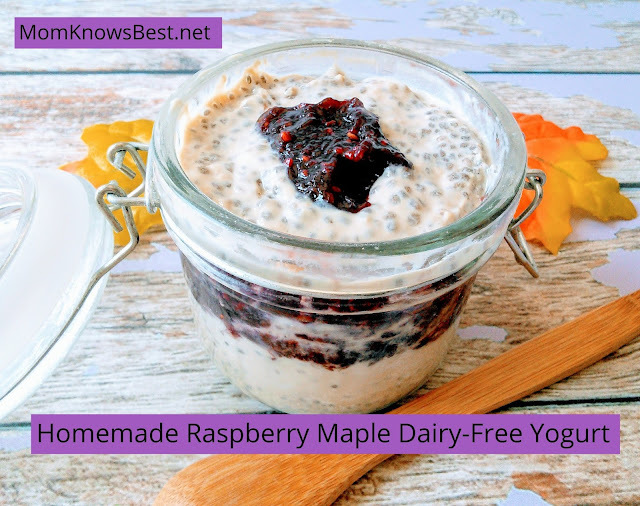 Raspberry Maple Dairy-Free Yogurt has all the healthy ingredient especially for someone like me who are into healthy living. Thanks for sharing the recipe! Gonna have it after my workout. Some great tips in here for a healthy alternative. I like to add stuff to my Greek yogurt, didn't realize I could make my own so easily. Thanks for the info! Yumm !! So good !! thank you for sharing that recipe ! I love raspberries !! This looks fabulous! I'm all about yogurt. This would be the perfect dessert. Plus I like that it's dairy free because my mom is lactose intolerant. This is so timely! I was thinking of going on a non-dairy diet for a while now, and this seems like just the thing I should try! Thanks! It's simple healthy and looks good too. My next evening snack is definitely this. I am sure kids will love it. I know someone who has an asthma so I know how hard it is. 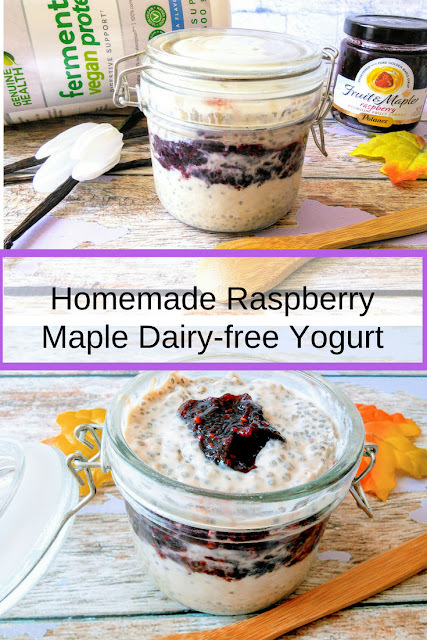 That Raspberry Maple Dairy-Free Yogurt sounds delish and a great alternative too. I'm allergic to dairy products too.. But it looks great. Yummy too.. This looks delish! I can't do dairy but it looks like the idea dessert. I like that it's dairy free. I have sinus issues that seem worse when I have certain dairy foods. I love yogurt, I will have to give this recipe a try. It's very difficult that you have an allergy I have a skin allergy too I know what it feels. 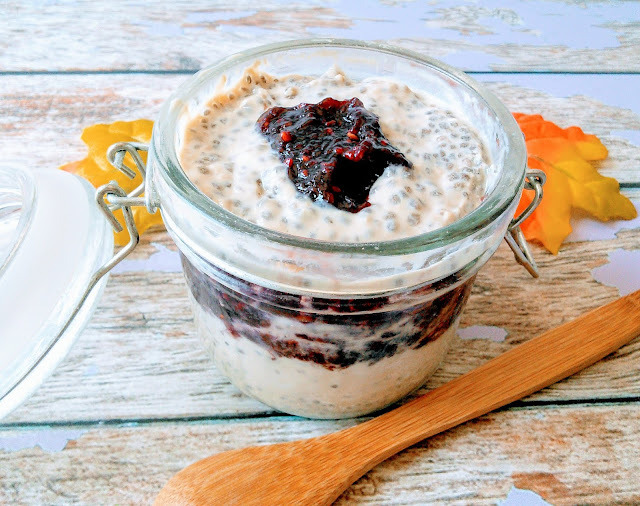 the Dairy-Free Yogurt looks yummy and healthy thanks for sharing us! This looks delicious and must make for such a perfect breakfast! It would be great to take it at work too! This looks yummy and tasty! Although I never knew something like dairy free yogurt exists! This yogurt looks so tasty. I love that it is dairy free. Omg this looks so good! I'd love to make this for my friend who doesn't do dairy. She'll love it! Easy to make recipes like this is worth a try! Will be making this soon for my family to try it out!